Sorting Out the Mammogram Debate: Whom To Screen When? : Shots - Health News Researchers suggest that guidelines for regular breast cancer screening should look beyond a woman's age. Dense breast tissue, a cancer risk factor, may be a reason to consider earlier screening with mammograms. A woman gets a mammogram in Putanges, France. Mammography outcomes from nearly a million U.S. women suggest which ones under 50 would stand the greatest chance of benefiting from regular screening: those with very dense breasts. That's been a bone of contention ever since a federal task force declared nearly four years ago that women younger than 50 shouldn't routinely get the test. A study in the latest JAMA Internal Medicine also provides reassurance that it's safe for women over 50 to get mammograms every other year — even if they have dense breasts or have taken hormones to reduce symptoms of menopause. Biennial mammograms for women between 50 and 75 are another flash point in the debate over the current U.S. Preventive Services Task Force guidelines. In addition to recommending against routine mammograms for most women under 50, the guidelines favor screening every two years for older women. Dr. Karla Kerlikoske, lead author of the latest study, tells Shots that it's an attempt to get beyond "this kind of simplistic view" of who should get regular mammograms based solely on age. "We try to say what puts people at highest risk," Kerlikowske says, "and particularly at highest risk for tumors that are more likely to be aggressive. Those are the people we really want to screen and try to find the tumors early." Some women in their 40s probably have a higher breast cancer risk than some older women, she says, and some women in their 50s and 60s probably have lower risk than most 40-somethings. "So the idea was to ask: Are there people at higher risk who should be screened differently?" Kerlikowske says. "And are there people at lower risk who maybe shouldn't be screened as often?" Her group focuses on two risk factors — especially dense breast tissue and prior use of hormone therapy, particularly the combination of estrogen and progestin. Highly dense breasts not only make it harder to spot breast tumors on mammograms but are intrinsically more likely to give rise to cancers. The study found that the women under 50 who benefit from annual mammograms are the 12 to 15 percent who have extremely dense breasts. That is, the test is more likely to find dangerous tumors that are larger or more advanced at diagnosis. For the other 85 percent of under-50 women, there's no added benefit. Annual mammograms don't find more late-stage tumors or those that are larger at diagnosis. But annual screening doubles their already high risk of false-positive tests and biopsies that seem to find cancers that aren't really there. "I want to be clear," Kerlikowske says. "This study does not say women in their 40s should undergo screening mammography." But for those who want to, the study supports the idea of annual mammograms for those with extremely dense breasts. Among women over 50, Kerlikowske thinks there's been a slow shift away from annual mammograms since the federal task force issued its controversial guidelines in 2009. "Our data reinforce the idea that women can be reassured they can be screened every two years, even if they're at high risk" by virtue of having dense breasts or having been on hormone replacement therapy, the University of California, San Francisco researcher says. The new data come from the Breast Cancer Surveillance Consortium, a network of mammography centers across the nation that record characteristics of women undergoing mammography. Those traits can then be correlated with later outcomes. Did the women have a diagnosis of breast cancer? Were their tumors advanced or large at diagnosis? Did their mammograms raise a false alarm? "The consortium really represents the demographics of the United States as far as urban-rural, economic status, ethnic groups," Kerlikowske says. "It's a huge population." Earlier controlled studies of mammogram screening from Europe have been criticized as not being applicable to the US population. The current study looked at 11,474 women diagnosed with breast cancer and 922,624 without breast cancer. While it is not a randomized controlled trial, it does collect data on women prospectively – before they've had a diagnosis of breast cancer, a false-positive or an all-clear. That reduces the chance that researchers distorted the results by retrospectively choosing which women to look at. "This is the first time we've actually looked at outcomes by risk factors," Kerlikowske says. It comes at a time when some states are requiring doctors to inform mammography patients if they have dense breasts so they know they're at higher risk of having difficult-to-diagnose tumors. California's breast-density notification law will take effect April 1. New York, Connecticut, Texas and Virginia have similar laws, and a dozen other states are considering such legislation. The problem is, there's no consensus on whether women with dense breasts should get additional tests beyond conventional mammograms. 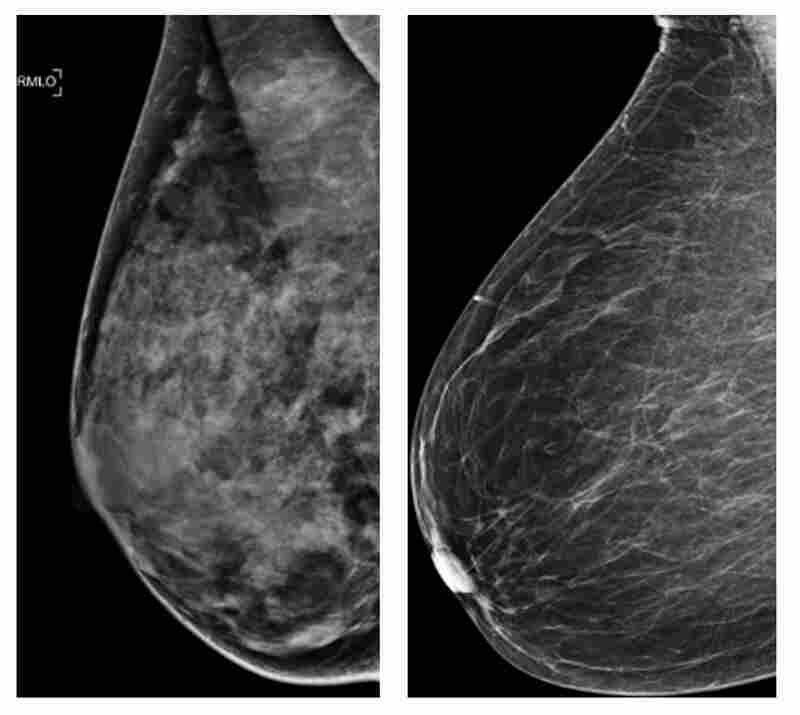 "The next thing we're focusing on is if someone has high-density breasts, do they need a different kind of imaging?" Kerlikowske says. The mammography consortium collects data on women who get ultrasound and MRI scans, but she says so far not enough women are getting another type of test, called tomosynthesis, to draw conclusions about its usefulness.